India, the land of festivals, celebrates all the occasions with great zeal and vigour. In fact, it is so amazing that you find several festivals in a single month. Hariyali Teej is one of the most awaited festivals of monsoon. This festival has great significance for married women. Today, India is celebrating Hariyali Teej. Teej is celebrated on third day of Shukla paksh of Sharvan month which falls on August 13 this year. Know more. Soon after the arrival of Shravan month (Hindu calender), women eagerly wait for this colourful festival. This festival signifies the union of Lord Shiva and Goddess Parvati. As per the Hindu mythology, Goddess Parvati worshipped and took 108 re-births to get married to lord Shiva. Finally, on the day of Teej, lord Shiva accepted Parvati as his consort. This day commemorates love and dedication of Goddess Parvati towards Lord Shiva. 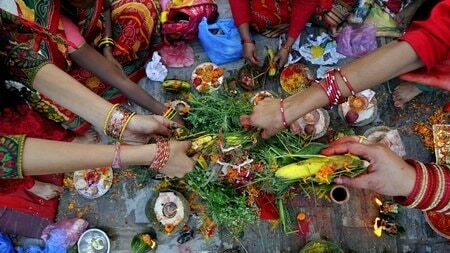 Celebrated in Northern and Western parts of India, married as well as unmarried woman observe fast on this day. Married women pray for the well-being of their husbands while unmarried women keep fast for a good groom. On the occasion of Hariyali Teej, green colour is meant to be worn. Women dress up in traditional attires especially of green colour. Green colour highlights the arrival of the monsoon season and the greenery and prosperity it brings all around. There is great significance of savouring ghevar and apply henna patterns on hands. Married women receive gifts, sweets and dresses from their in-laws. The muhurat of Hariyali Teej has begun at 8:38 am today and will end at 5:46am on August 14.